The Eurasian Journal of Biological and Chemical Sciences (Eurasian J. Bio. Chem. Sci.) is an International, Peer-reviewed, and Open-access journal and invites contributions of original and novel fundamental research. The journal aims to provide an international forum for the presentation of original fundamental research, interpretative reviews and discussion of new developments in biological and chemical sciences. It is devoted to the publication of contributions in all fields of biology including microbiology, parasitology, biochemistry, biophysics, molecular biology, physiology, pathology, health sciences, pharmacology, toxicology, biotechnology, biostatistics, bioinformatics, environmental biology, hydrobiology, food science, nutrition, agricultural sciences, agropastoralism, animal production, wildlife, botany, ethnobotany, forestry, agroforestry and agrogeology. It is also devoted to the publication of contributions in all fields of chemistry including chemistry of natural products, organic synthesis, physical chemistry, analytical chemistry, inorganic chemistry, pharmaceutical chemistry, industrial chemistry, clinical chemistry, hydrochemistry, agrochemistry, geochemistry and biogeochemistry. Eurasian J. Bio. Chem. Sci. publishes original research papers, critical up-to-date and concise reviews on topics of current interest, and short communications. Two issues are published per year. The studies submitted in 2nd International Eurasian Conference on Biological and Chemical Sciences (EurasianBioChem 2019) will be published in Eurasian Journal of Biological and Chemical Sciences after the referees evaluate them. 2. 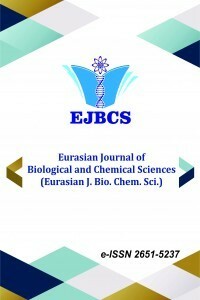 Uluslararası Avrasya Biyolojik ve Kimya Bilimleri Konferansı (EurasianBioChem 2019)’nda sunulan çalışmalar hakemler tarafından değerlendirildikten sonra Eurasian Journal of Biological and Chemical Sciences’da yayınlanacaktır.